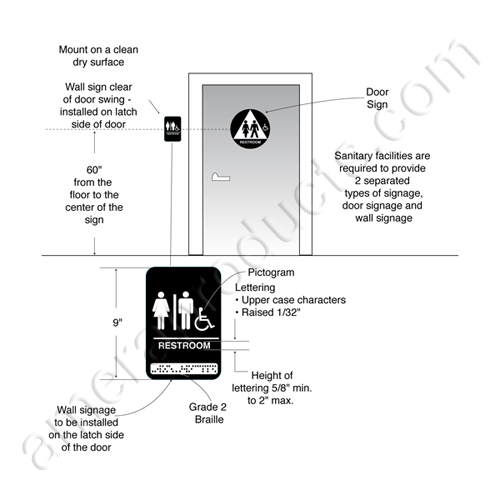 Restroom signs are required to meet building codes and come in several types and styles. Common 6" x 9" restroom signs and Title 24 signs used in California and other states to meet ADA code are generally made from durable plastic. These signs are easy to install. Youth labeled signs can be used in schools, churches and daycare facilities. Restroom signs, 6x9, in 5 colors click here. Restroom signs in public restrooms, banks, schools, airports and government buildings look the same for a reason. Many times funny or humorous signs seem like a great choice when it comes to buying a restroom sign but it could be confusing. Consider that visitors and customers are looking for a specific room. Sometime, there is an urgency associated with their need. The best way to help people is to clearly mark the restroom for them, elevating any confusion. Using a quality standard sign that is easily recognizable is probably the best way to do this. When you saw the images at the top of this page, you instantly new this was a place to find restroom signs....it works! In states that require the Title 24 sign, the large sign, is the Title 24 sign and is normally installed on the restroom door. It maybe also required that a 6x9 sign be installed on the wall next to the door.